This past weekend Yakir Englander visited Tom and me and our family at our lake home in the Laurentian Mountains north of Montreal. It was a joy to share with him so much of what the lake means to us; the early morning quiet and the glassy calm, the rambunctious playing on a dock full of kids of all ages, and the solitary kayak paddle in the late afternoon accompanied by haunting loon- calls. 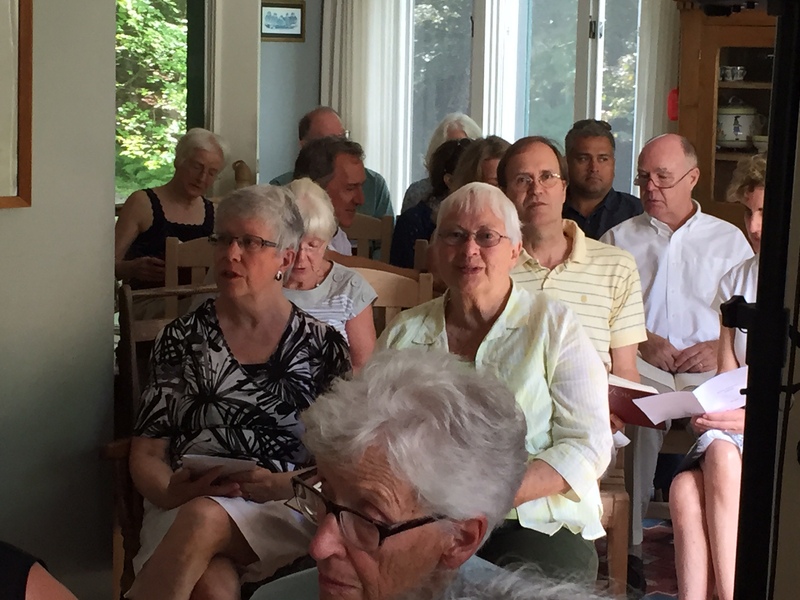 Underscoring the fun-filled stuff of a Canadian summer is some meaningful history – most notably our Sunday Services which have been going since the summer of 1889. Each Sunday durning the summer the community gathers at someone’s home for church, see the attached bulletin of the service that Yakir and I put together. Yakir sang the Jewish parts in Hebrew and I did the rest; and Yakir gave the “sermon”. He spoke with his usual brilliance, passion and conviction about the dangers of believing we know “the truth” and the beauty of our Kids4Peace experience. He spoke about our sharing our love of our religious traditions and learning the difficult skills of authentic dialogue. He spoke too about how those experiences opens our hearts, minds and lives and changes us forever! The congregation was captivated! Following the service there was an enthusiastic rumble of chattering as people tried to reach us to comment and share their responses. Included in the group were people connected to the foundation world, and well known private American schools all brainstorming about how to make connections with Kids4Peace. The buzz is lingering, people are still coming up to me on the lake and talking about it!